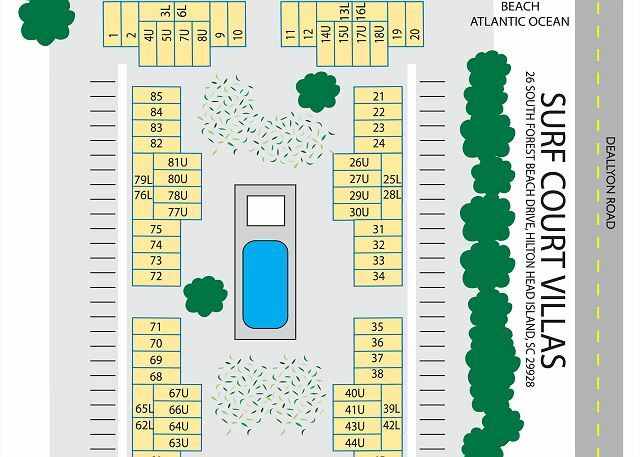 Surf Court is located in Forest Beach just 1 block to the ocean. Surf Court #71 is a ground floor entry with your living room, dining room, kitchen & half bath are all on the ground level then your bedrooms & full baths are upstairs. 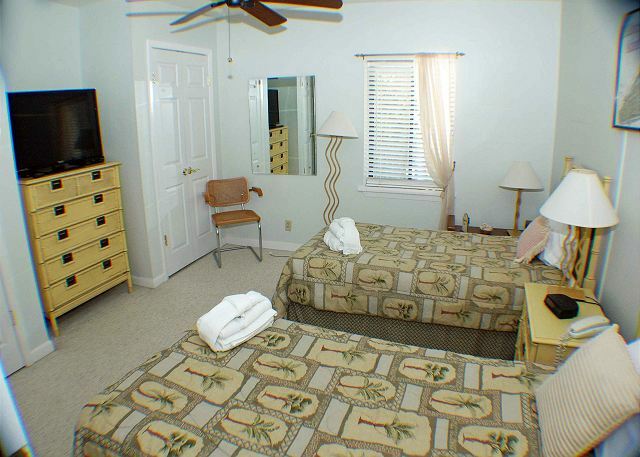 There is a king bed in the master, two twin beds in second bedroom plus a sleeper sofa. 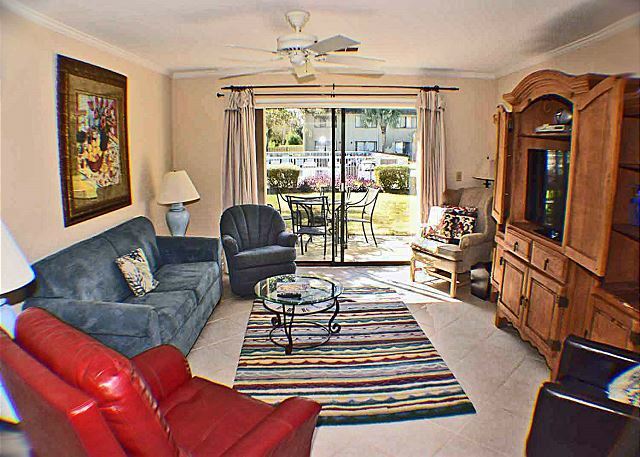 The condo sits right off of the pool area and has a great patio to enjoy. 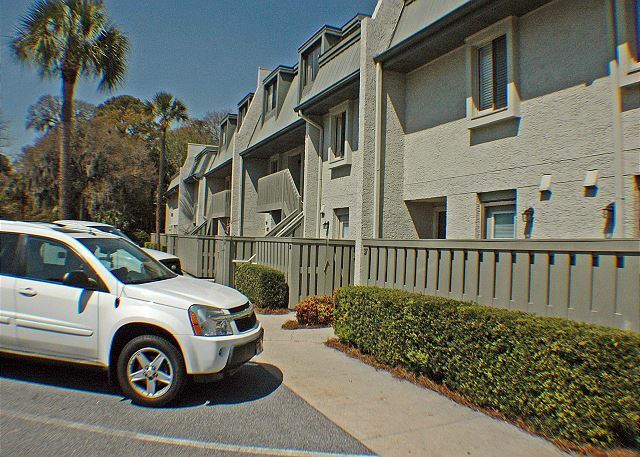 The unit has internet access and 3 flat screen TV's, plus nice décor and a comfortable large space. Walk in shower in the master bathroom. 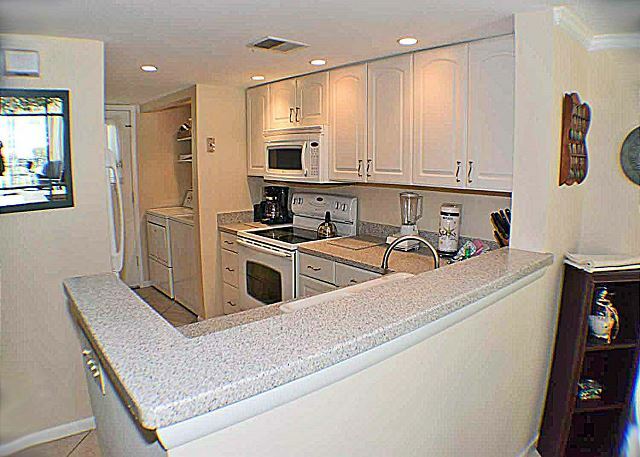 Renters come back year after year to this favorite location. Within walking distance are shopping & dining, live music, ice cream, and of course the beautiful sandy beaches of the Atlantic Ocean. 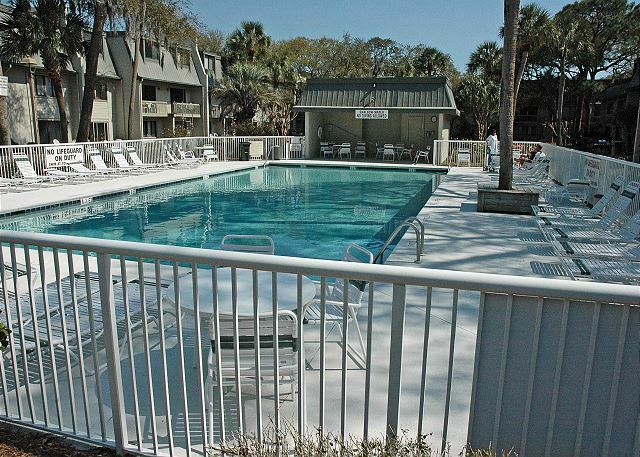 We normally book and stay in Hilton Head with Seashore vacations over Memorial Day weekend, but we were unable to go this year. We were able to put something together last minute for the following weekend and Seashore was great. We booked on Thurs. for a Fri-Sun getaway. Couldn't be happier with the staff. Thanks again, and we look forward to booking with you in the future. Villa was spotless and had everything we needed for a relaxing vacation. Very Clean and easy access to the pool. Overall good experience. There is no view of the ocean. 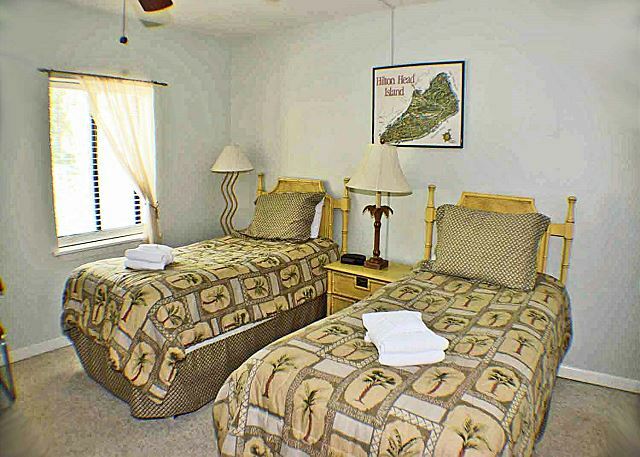 It is close to the ocean and shopping and dining are also in walking distance. The television cable is limited, so if you want to watch much TV it is not the place. The pictures don't begin to describe how cozy and comfortable this townhome really is. The location was just perfect as well. If I had to be extremely picky, I'd say the screen door was difficult to open, the master toilet was slow to fill, and the clothes dryer took a very long time to dry clothes. These are so minor compared to the positives. I would certainly return to this unit and recommend it to others as well. We had a fantastic vacation in Surf Court 71! We've visited Hilton Head Island 3 times and this is our favorite rental so far. The location, size of the unit and layout was perfect for our family. The kitchen was well equipped with utensils and dishes (an ice cream scoop would be a nice addition) and everything was in working order.The bedrooms were very spacious and had plenty of storage, including double closets in each bedroom. We loved having the pool just outside the back door and made great use of it throughout the week. My only complaint would be the bed in the master bedroom. Although very soft and comfy, it appears to be very broken down and there was little to no support so my husband and I both woke up sore everyday. My husband actually wound up sleeping on the sofa a couple of nights just to save his back. 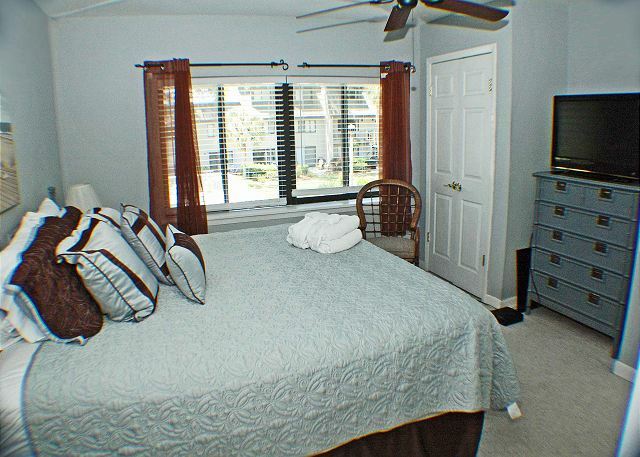 If the master bed gets replaced, I would most definitely rent this unit again. Renting this unit was like staying at a friend's house. It was fully equipped with everything we needed. The bed was very comfortable and everything was quite clean. We did struggle with the sliding door to the patio a bit but once I put it back on the track it worked just fine. The carpet upstairs and coming down the stairs looks to be worn enough to be in need or replacing but definitely not to the point where there was any trip hazard. 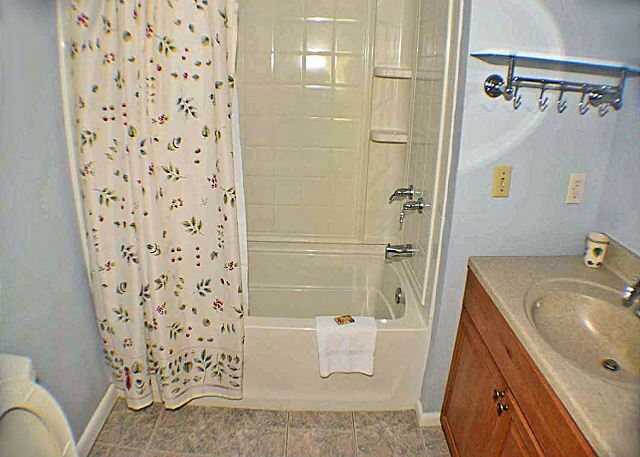 The only problem to note was the toilet in the master bedroom took forever to fill which made it a bit inconvenient when the next person needed to go right after you. The location is great! We walked to the beach and lot of shopping. We would definitely stay here again! The management company was great to deal with and delivered everything as promised. I highly recommend this unit. Great location! 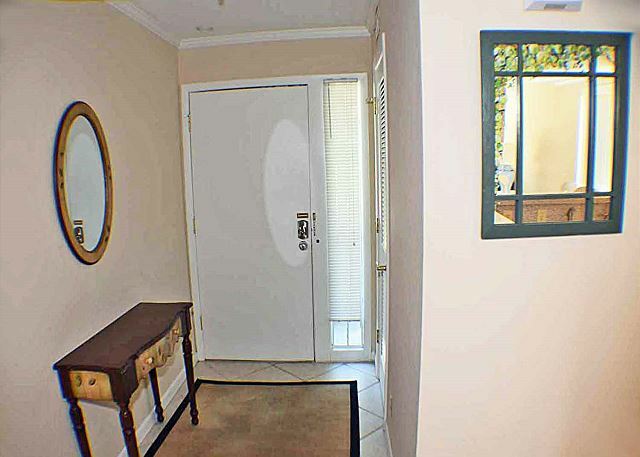 Close to the beach and short walk to shops/restaurants. Made for a great vacation! This is the first time my husband and I could do more than one week at a time. we didn't do our rental search until late in the season. 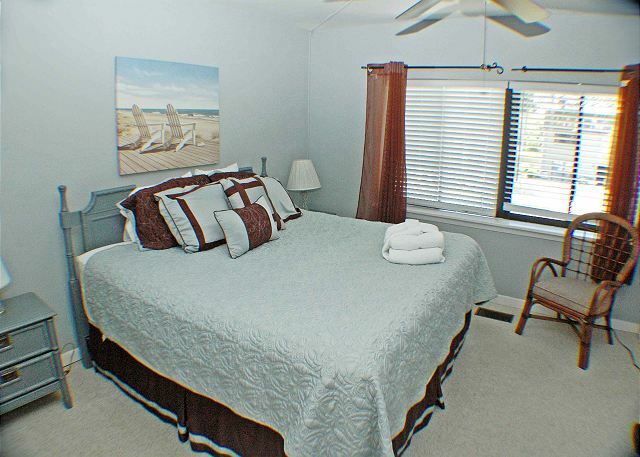 We were looking for pet friendly with close proximity to the beach. I quickly honed in on this unitbecause of the green space outside the patio doors would be great with the dog. Only quick to find out we couldn't even let the dog on the concrete patio. So the only issue would be pet facilities. The space and size of the unit was exactly what we wanted. Check in and out was the easiest we have done anywhere. We will consider using your company again in the near future. 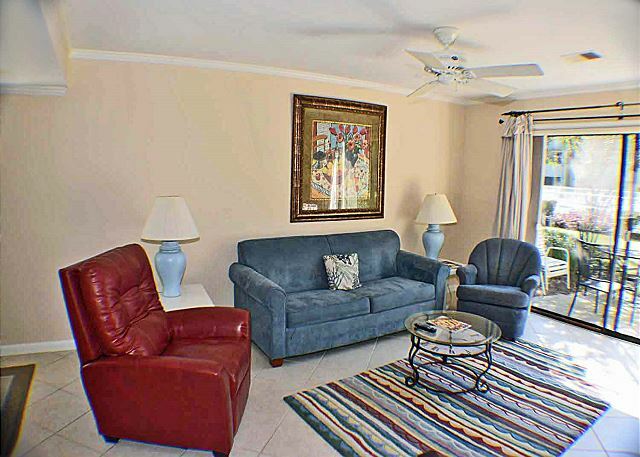 Great location, easy walk to beach, shops, and restaurants. It is a good place to entertain a few people for dinner. Came for a four night stay in February 2016. Check in, drive to condo and location of condo were great. 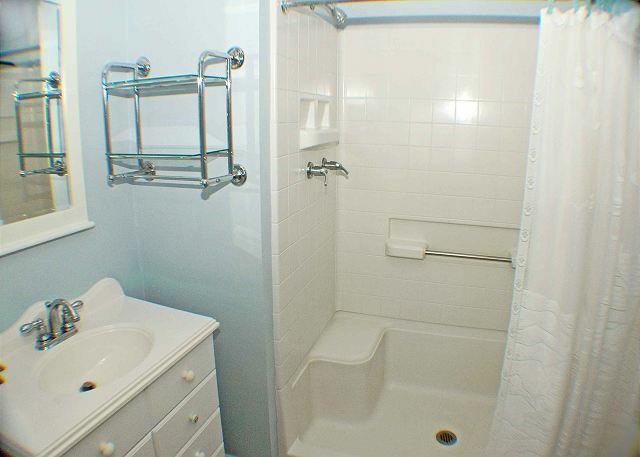 Very clean, pet-friendly and spacious enough for the four of us. Community pool was just outside our back door. All amenities, appliances and starter supplies were provided. Only issue was back sliding door. I had noticed other reviewers complained about it and was surprised it had not been addressed. It was VERY difficult to open and close . Weatherstripping was bunched up at one end. I think it's time to replace- that is why it was given four stars. 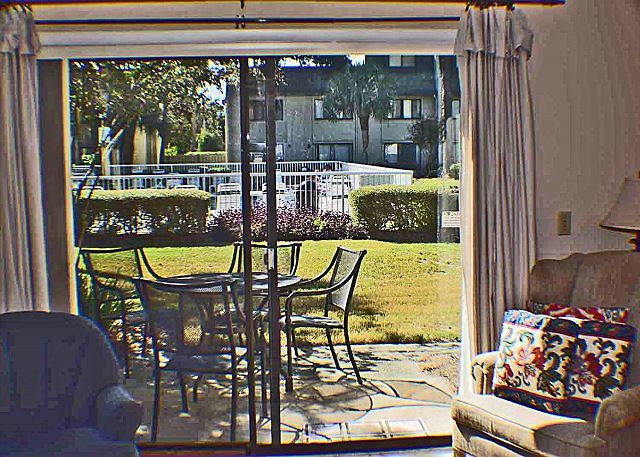 Sliding glass door at Surf Court 71 has been repaired since this review was initially posted. Come check out a great condo. 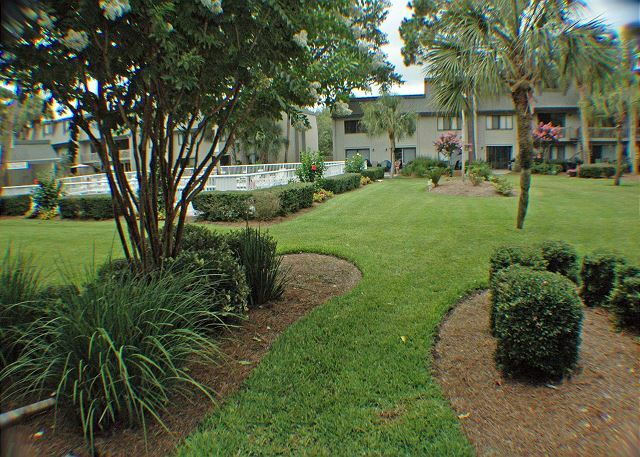 Excellent location with walkway to beach directly across the street. 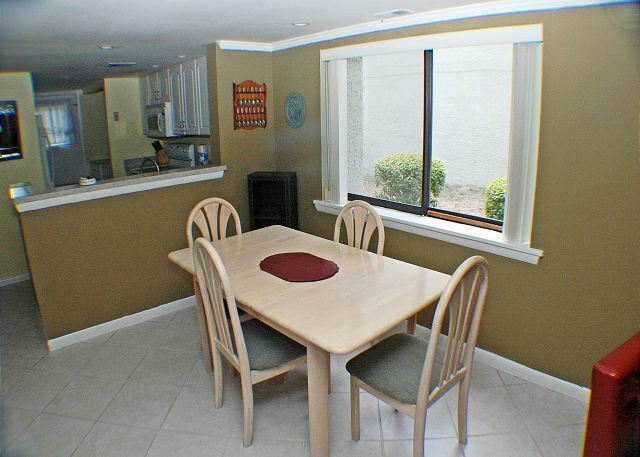 Villa was clean & pleasant with a patio and community pool outside the door. First floor entry was convenient and we were grateful that owners allowed us to bring our dog. Booking process was friendly & efficient. New Sea Pines Beach Club is great & sunset at the Old Fort Pub was spectacular, as always. Thanks so much! Nice clean rental. Great location. Backdoor needs to be fixed kept getting stuck and at one point had to walk around the building because door would only slightly open. 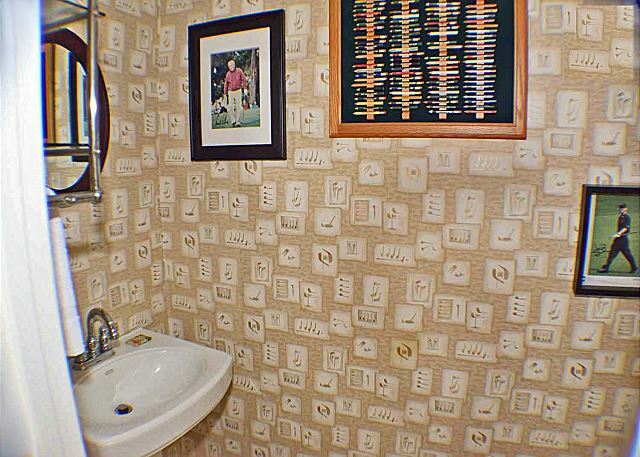 My family and I were not impressed with this vacation rental. We have been coming to HH since 2001 and we know which part of the island we prefer so the location is perfect for us. However, the property was very dusty. There was dust caterpillars on the ceiling fans, the vents were fuzzy, the 2nd bedroom walls had dust bunnies on them. The painting of the property was messy. 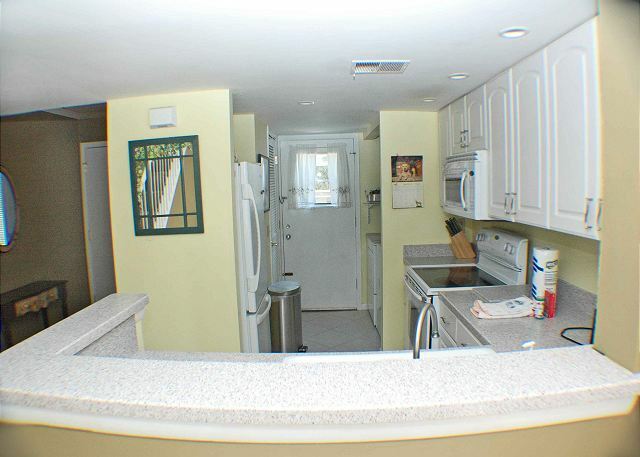 It just did not appear as a professional rental space. Also, we found the furniture very uncomfortable. Not the same as the pictures. We also did not like all the pool restrictions. We will not be staying here again. We were satisfied with villa and location. Being pet friendly was great, but the location of the unit made it a bit inconvenient when taking our dogs out to potty. They weren't allowed in the courtyard and the nearest grassy area was quite a distance away from the villa. We did appreciate being able to bring them though. The pool closed very early in the evenings, 8:45, much to the disappointment of our teenagers, who would have liked to swim a bit longer!! Air conditioning in the living room area was basically non-existent and door wall was hard to open, but these are things that were mentioned by other reviewers, probably should be addressed. Overall, no major issues, we enjoyed our stay. The air conditioning was not at full capacity which made it uncomfortable at times. We called to have it fixed and believe they came when we were out but it only improved minimally. Our friends next door was a lot nicer in terms of a/c comfort compared to ours. Also, the back door was very difficult to open and close and was noisy. Very nice place to stay, very happy with with our stay. Our week was awesome. The sliding door and dryer had issues so we called about them and they were both promptly handled. We did find a small amount of feces behind a bed which had obviously been there quite awhile . Other than that everything was neat and clean. 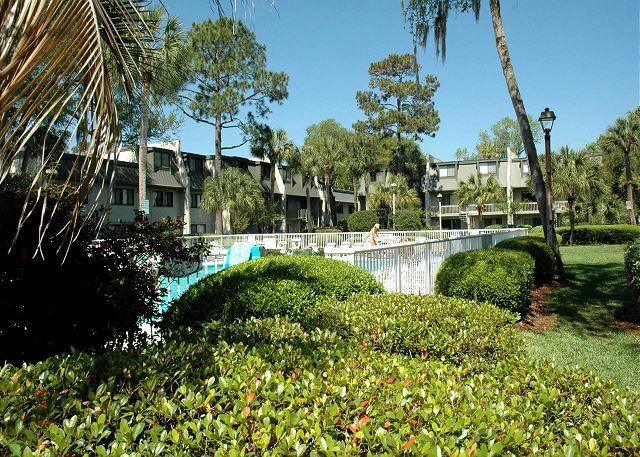 I liked the location as the beach is easily accessed and coligny circle within easy short walk. I would stay here again. 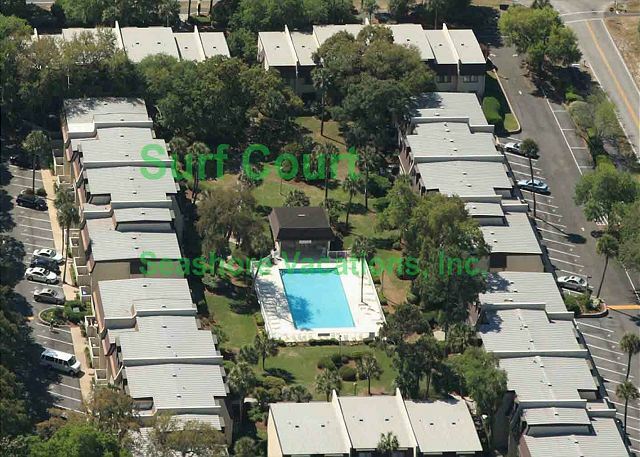 Surf Court 71 is a very popular Pet Friendly unit (dogs 25 lbs or less). While it is not uncommon for a pet to have an accident - most pet owners are very diligent about monitoring the animal's activities. We also have the carpets cleaned periodically. In this case - the carpet was cleaned on 5/1/15 which was 3 weeks prior to this week. We also use a professional cleaning service for housekeeping in between rentals who bring in fresh linens & towels for each new guest. They also clean the kitchen, baths, dust, mop, etc. - a pretty thorough surface cleaning. However, they do not move beds or big pieces of furniture while they are performing this service. At least once per year we perform an Annual Deep Clean which does involve moving furniture, wiping down baseboards, removing all items from the cabinets/drawers and wiping them out, light fixtures, cleaning behind & under beds, dressers, sofas etc. Regardless, it is unfortunate that a small dog found it's way under a bed undetected. Thank you for also mentioning the many positives that #71 offers. This unit was PERFECT. They provided a lot of great amenities such as dishwashing soap, laudry soap, etc. Towels were full size and thick, not cheap towels. 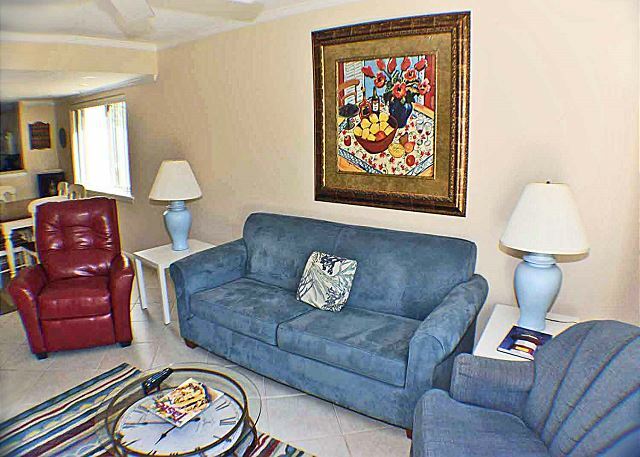 The unit was very tastefully decorated and furnished. My only comment is that the king bed was a little soft for my liking and the twin beds in the 2nd room blocked the bathroom door from closing. I believe they could rearrnge the 2nd bedroom furniture to remedy this. 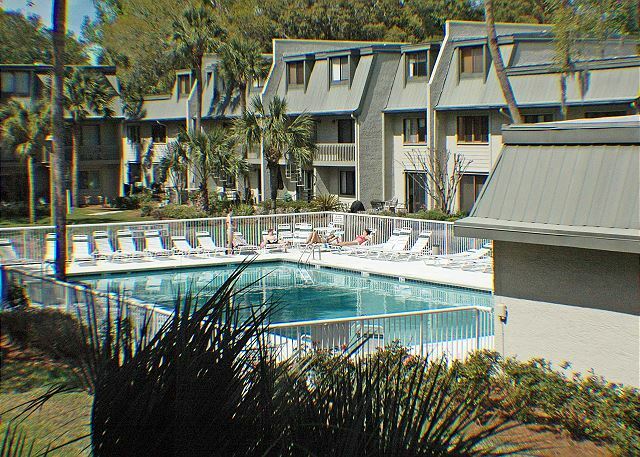 The location of the unit on the property is perfect being right off the pool. The location of the property is great. 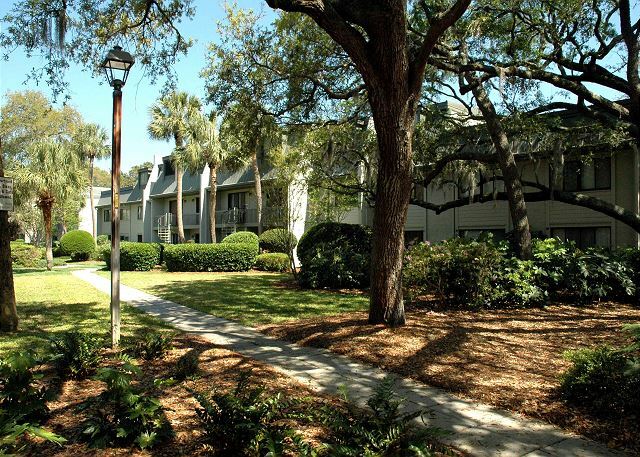 It is a brief walk to the beach, and close to Coligny Plaza where may stores and retaurants are. I would definately go back and stay at this unit again. I thought it was very good. We like the location and the unit was clean. Our rental was handled thoroughly and professionally. 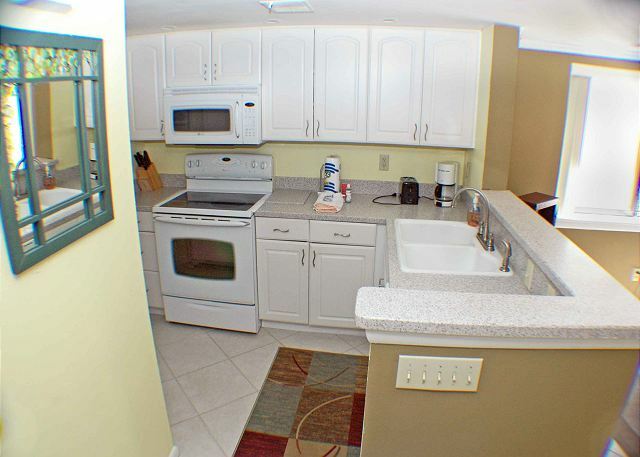 Our condo was very adequate during our time there, comfortable beds and amply-supplied kitchen. The patio area could have been nicer - and we found that the sliding patio door was very difficult to use. 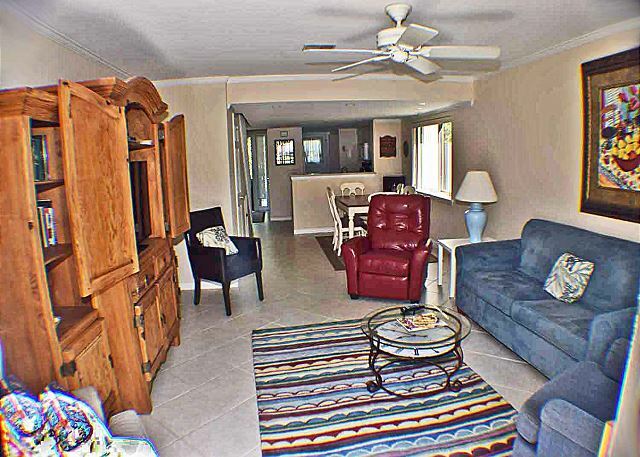 Great location for easy access to the beach and shopping. We would definitely stay here again.